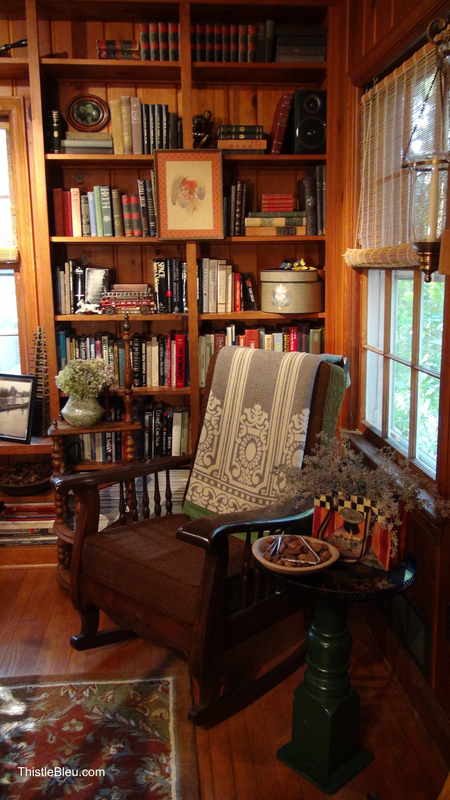 We bought our house because my husband fell in love with the knotty pine library/den. I think he half-expected Bing Crosby to jump out of the closet, pipe in hand, clad in his signature smoking jacket—and yes, of course, singing ‘White Christmas’. It was definitely a throwback to the 40’s and 50’s. It was a man cave for 7 years while my dining room languished in the front of the house. I flip flopped the living room for the tiny dining room after a few years. Yep, the dining room was now a foyer/dining room. Every woman’s dream! Every now and then I suggested moving it to the den but you know how men love their caves. Right, not happening. How did this come about you ask? We visited the Brandywine Museum in Chadds Ford, Pennsylvania. 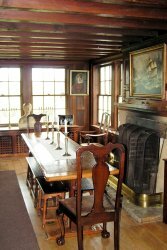 We viewed the artwork of Andrew Wyeth and his father, N.C. Wyeth, and toured the family’s home and studio. 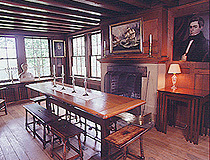 Late in the tour, the guide explained that N.C. Wyeth had built on a paneled dining room. We entered the room and there it was—a charming dining room with paneling, wood floors, fireplace and a farm table lit by candlelight. My husband looked at me and said “Oh, this is great!” Oh, good grief. 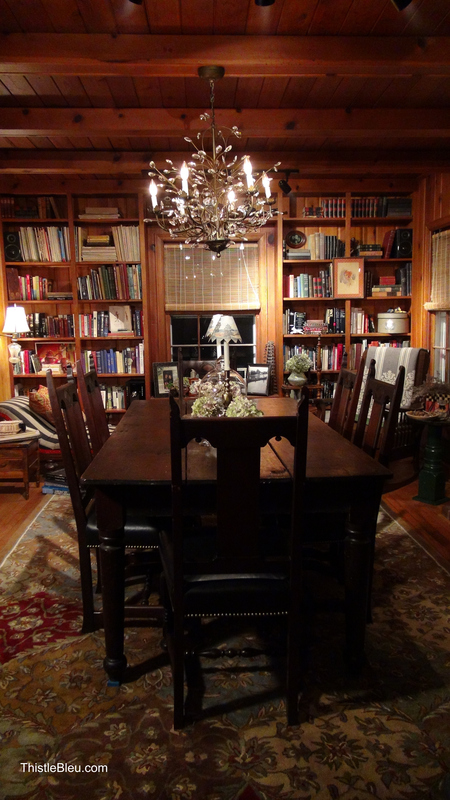 When we got home that evening we moved the dining room to the den. I was ecstatic. A few weeks later I had the beam wired for the new chandelier that I found on Overstock.com and added an area rug from HomeGoods. Our early MacKenzie Childs wall-mounted tray and enamelware ‘Cake Carrier’ with my grandmother’s old wooden sieve from her bakery. 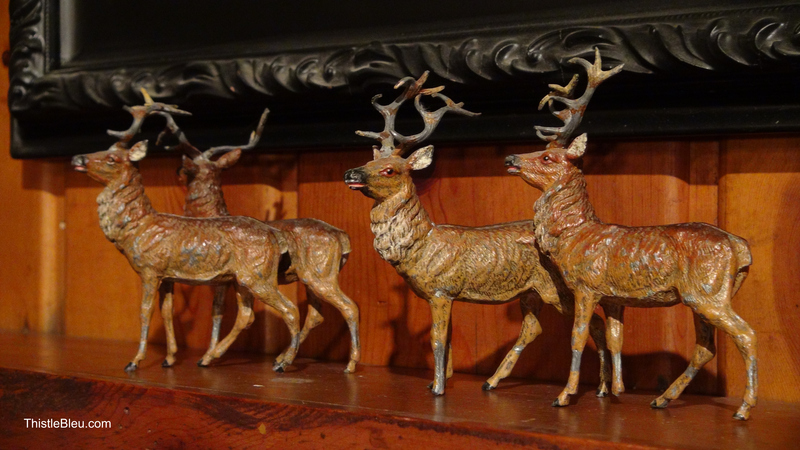 Finally, there is room in our dining room for cherished family heirlooms. My dad’s old rocking chair from years gone by. 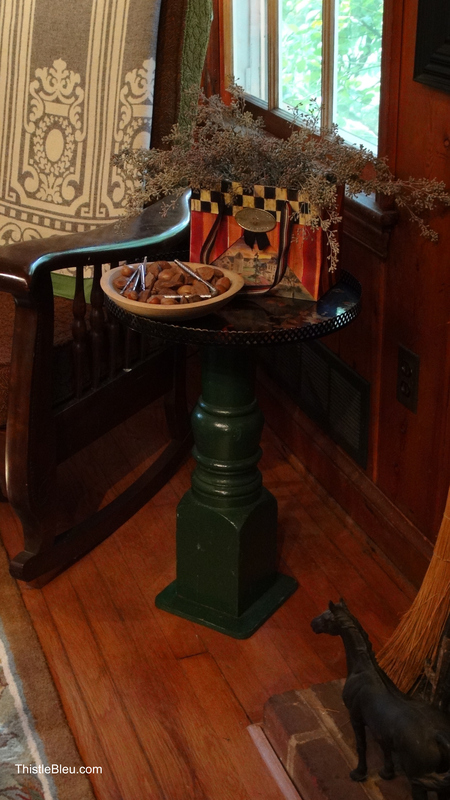 I joined a flea market baluster with a thrift store tray. Just a bit of whimsy. Love the blue of this cast iron pot. I spent my summers growing up on Cayuga Lake in Upstate New York. By the time I married, MacKenzie Childs had been established in Aurora right across the lake. So visits home always included a stop in Aurora. Some visits were even timed around their barn sales—we all have our priorities! The ‘High Coffee’ on the mantle is in their old Taps pattern. The old fainting couch was my very first auction find. The reupholstery still looks great years later. When we opened it up we found that it was stuffed full of straw. As the sun goes down and shines in this window the whole room starts to glow. It’s our favorite time of day in this room. I was thrilled with my latest find. An old bobbin etagere from a thrift store! The perfect display piece for a tight corner. Such a great ceiling! Hard to believe that it leaked like a sieve within days of moving into the house and the fireplace turned into Niagara Falls. Owning an older home can be like walking through a minefield. Something always needs to be repaired. See those white dots. That is where the holes were drilled into the ceiling to take care of the carpenter ants. Apparently, carpenter ants love wet wood. 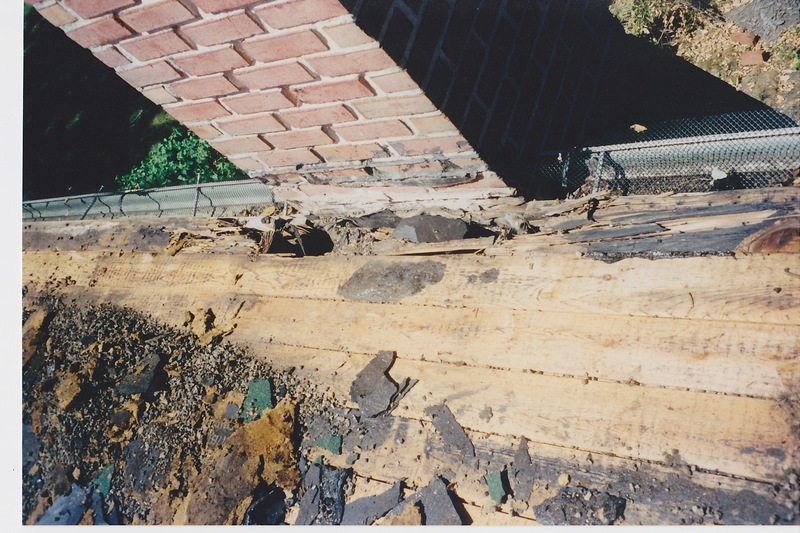 Here is the view of the roof while under repair. No wonder the fireplace turned into a waterfall with every passing shower! Before you ask, yes, we did have a home inspection. We even had a separate roof inspection. I guess we should have been present when the inspector was there. Oy vey. Buyer beware! 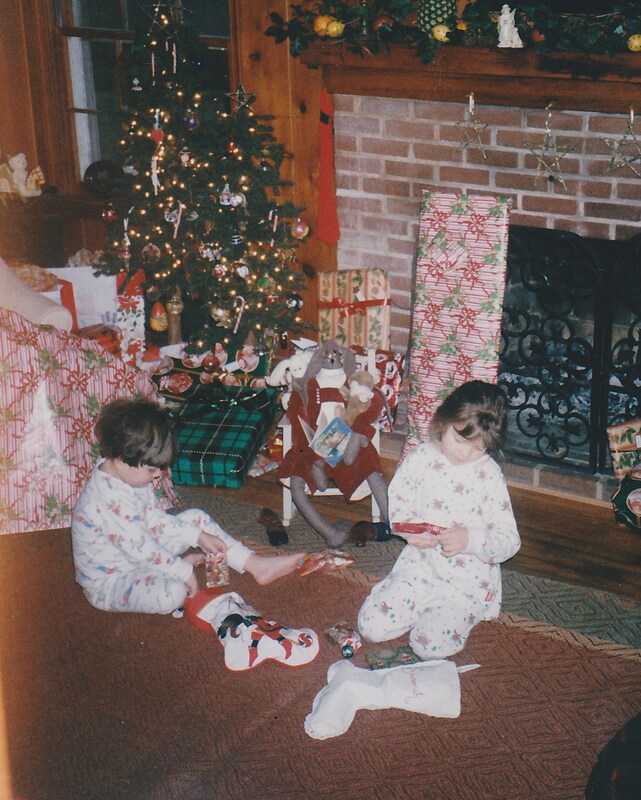 Note the white water stains on the brick fireplace. This was a quick fix. Repointing the mortar and a coat of dark green paint was all it needed. Here is the photo we took of the room during the open house. We replaced the track lighting with smaller halogen lights. My husband has since moved his man cave to the basement. It took a big flat screen TV to lure him down there but … he loves his new cave. And yes, that is knotty pine, too! This room is gorgeous. I think you single-handedly just brought knotty pine back in fashion. This ‘new’ dining room is so charming. 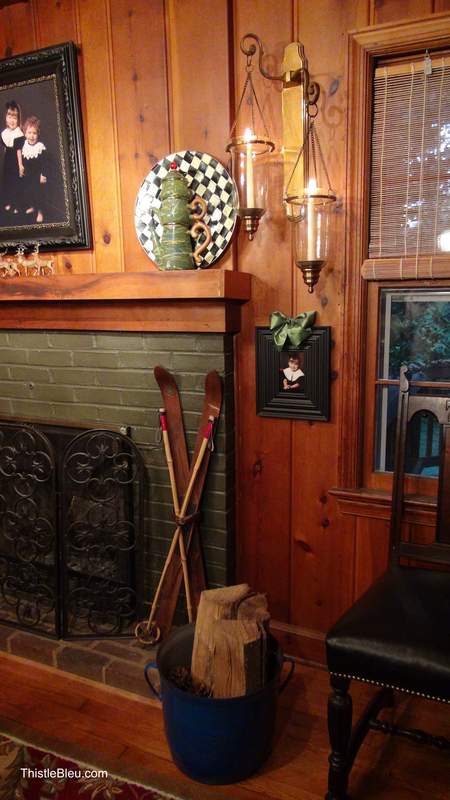 Who knew that knotty pine could lure you in and ask you to take a seat and cozy up to you and make you smile. That is how you transformed this room. Plus, I am a huge MC fan! I love the warmth of the wood! Great space for your large table! A great look for fall! Wow, it is a great looking room. 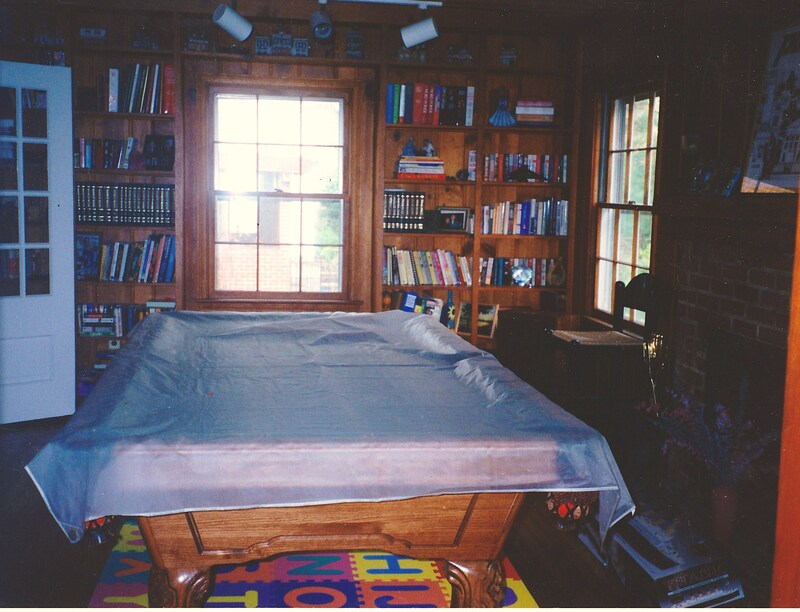 I would have been trying to cover the paneling until now that I see your fabulous room. Lynette, I LOVE your “new” dining room! I has so much warmth and character and your centerpiece on the table is gorgeous. Visiting from French Country Cottage. Congratulations it is beautiful what a spectacular space I would love to have it U r one lucky family. So glad you kept the pine!! What a warm dining room, and the Mackenzie Childs brings back memories of having tea at their old NY store! 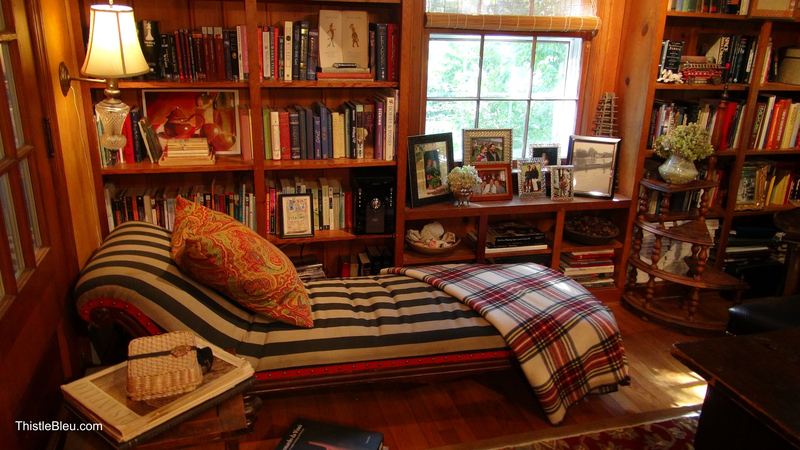 This room is fabulous and cozy. This will be one of the features at Wow tonight. What a beautiful room. 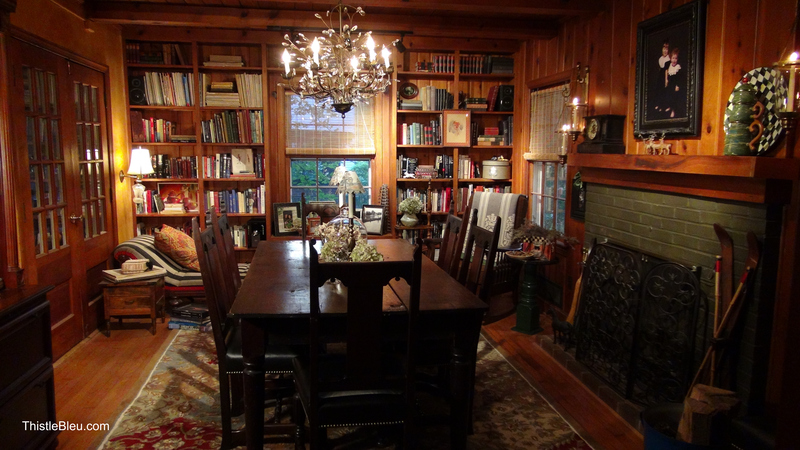 I hope to someday have a dining room/ library with or without knotty pine. Hi! I love this new room! I love knotty pine, too. We live in a 1939 cape cod style house with knotty pine. I would never think of changing it. It is so warm and cozy. I am your newest follower. Please stop by when you have a chance! Great post! What a difference! You have an eye, and lovely knotty pine…. Beautiful!! Thank you for sharing at Feathered Nest Friday!! What a great idea. love the room, love your blog! 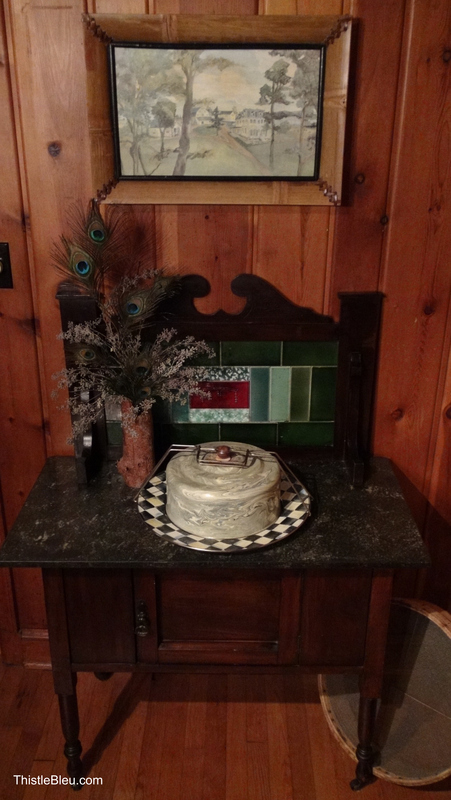 Well, I love the knotty pine, and I am a long-time MacKenzie-Childs collector (since we married in 1988). Your room is stunning! I am your newest follower. My daughter and I visited the Barn Sale in Aurora this year and had an absolute blast! We also visited Ithaca (Cornell) and King Ferry Winery for some Treleaven wine! Your living room is stunning..from the wall wood pannels, to the fire place and beautiful built ins. 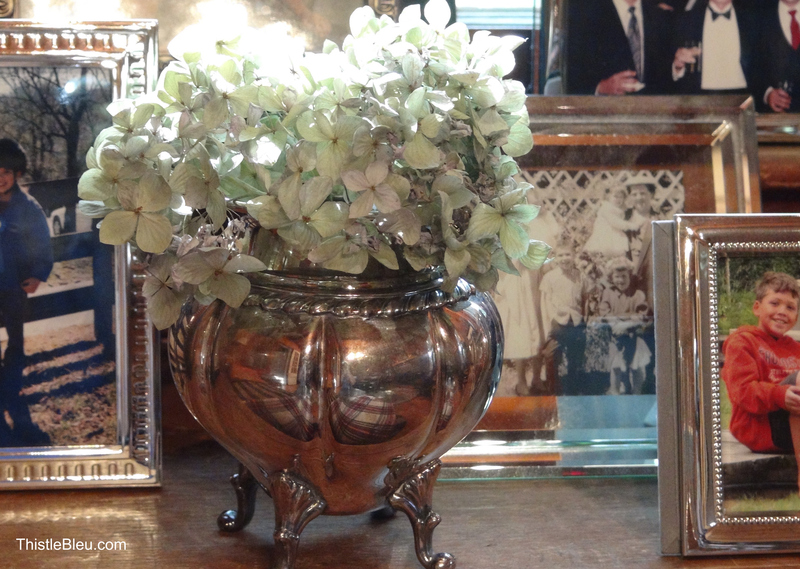 I love your corner piece with the beautiful collectibles. Hugs from The Polo House. This is a lovely room and perfect for a dining room. Don’t you hate that it takes so long for SOME PEOPLE to see things our way. 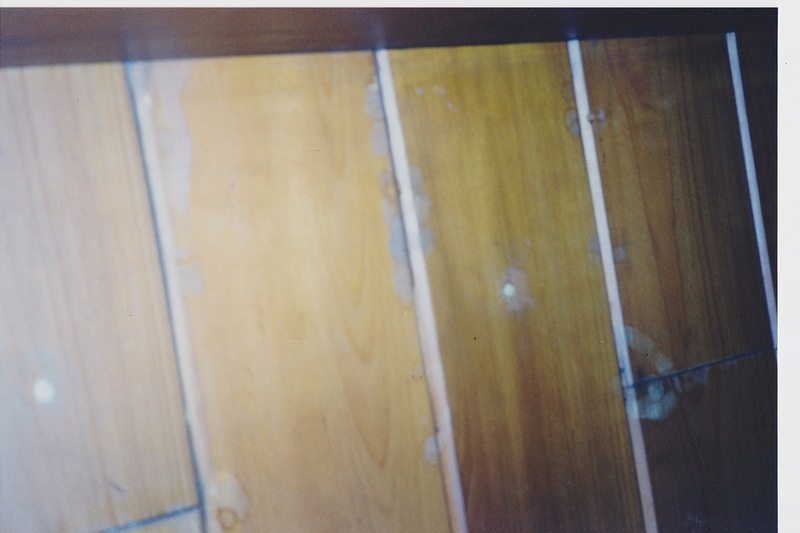 I grew up with knotty pine and Bob and I still love it. We hate to see it pulled out or God forbid painted a solid color, I like the word embrace. We need to do more of that. Oh BTW, too bad you couldn’t get Holmes on Homes to do the work. What a perfect and cozy place to dine! How fateful was that trip to Brandywine, too? Your new/olden dining room is just beautiful! So charming and cozy! Love all your decorations too! I know you’re thrilled to have this wonderful space. Your room is drop dead gorgeous!!! I live in an older home too. I adore your collection of MacKenzie Childs. Send a pic when you finish the room. I would love to see it! Oh my gosh! love your it gorgeous! Thank you for sharing Lynette!